A2Z is contracted by Baltimore County to provide 30 yd containers to be used for Community Clean-Ups throughout the county area. Scheduling takes place at a minimum of 30 days in advance. Usually, a representative from the homeowner‟s association will call Dispatch to schedule a Community Clean-Up for their community and then submit an application to the County for approval.. A Clean-Up is held on a Saturday. The number of containers allowed depends on the size of the community. A minimum of one container and a maximum of eight containers can be obtained free of charge to communities in Baltimore County if approved by the county. The Clean-Up is usually held between 7:00am and 12:00pm. The community provides a map of their community and marks placement for the containers. Containers are delivered before the starting time, so the community can mark the cans for the type of debris. Sometimes the containers are stacked, or doubled for shorter delivery times. The debris must be separated by type. All metal products must be in one container, brush in another, general trash in another container. If the community is only allowed one or two containers, they must limit the type of debris they will accept. A2Z will deliver the containers where directed. If a problem arises, the A2Z driver will contact the person in charge and work with them to rectify the situation. At the larger Clean-Ups, the A2Z driver will stay on site to assist. As the containers are filled, the driver will remove them from the site. 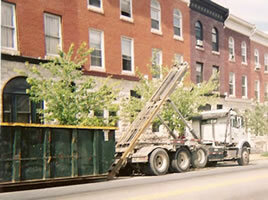 If the container contains metal, the container will be taken to a scrap yard for recycling. If the container contains brush or trash, it will be taken to Eastern Landfill in White Marsh for disposal. Baltimore County waives the dumping fees for all Community-Clean-Ups. After dumping the container, it is returned to the Joppa yard. This pattern is repeated until the clean-up is completed. 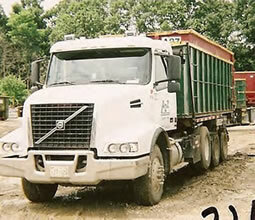 The communities can use the containers until 12:00pm, then they are dumped at the landfill and returned to the yard.